If you’re you are looking for the list of the best and cheapest kitchen appliances and accessories from Amazon or Ikea – this is not the place. If you’ve ever attempted to purchase cookware for a new kitchen or simply tried to improve the quality of tools in your current kitchen, you’ve probably found that stocking up on high-quality kitchen essentials is much more difficult than it should be. There is so much choice in terms of brands, origins, materials so it easily becomes confusing. and so on. Instead of all this increased choice making our lives easier, it’s made it that much more difficult to separate the quality from the junk. Being in this business for a few good years now and having advised thousands of our customers, we’re quite comfortable to list, what kitchen equipment we could recommend in all honesty, making stocking a minimalist, high-quality kitchen as easy as possible. And yes, we will be biased towards Japan-made products. They are simply better. After starting our Japana journey and having learned about Japanese knives, we wanted to keep continuing stocking high-quality products, which sometimes were not made or available to import from Japan. And in many cases it was ok. Importing walnut wood products from Japan (which Japan is not famous for) while denying to purchase from European suppliers would be simply a stupidity. We needed to find balance, but we always had a minimalist, natural and modern feel in mind. But after years speaking to experts in cooking techniques, creating and testing simple recipes, learning how to plan our meals our moms live far away from us) we learned exactly which tools one needs (and doesn’t need) to stock a fully functional and multi-purpose minimalist kitchen. While design and aesthetics are important, (especially for us, women) in purchases we always turn into reason. We dug into the best high quality and versatile kitchen essentials that provide the most value for your money. If you’ve only ever used a cheap chef’s knife for your cooking needs, switching to a high-quality knife like a handmade Japanese knife will be a night and day difference (it’s hard to find a bad quality Japanese knife! – Japanese blacksmiths take pride in their products, they treat them as an art with a soul!). Seriously, when we upgraded to a high-quality chef’s knife three years ago, we couldn’t believe how much sharper, heavier, and easier it was to cut and chop with the quality knife. And since you can use a chef’s knife for all of your cutting needs (and use it every time you cook), one high-quality purchase will serve you for years to come and if properly maintained – you can pass it to the next generations. When we got our first Japanese knives, we tested several different chef’s knives with different price points and designs. We also experimented with German-made Wusthof chef’s knife or French knives. Now we’re faithful to Japanese knives only. Moritaka, Naoki Mazaki and Yu Kurosaki knives are in their top league and we’re sure they won’t disappoint you. Aomori Hiba is one of the most prestigious and luxurious woods you can get. Used to build Japanese shrines, since recently it is also used for cutting boards in the kitchen. Very delicate to your knives, helping them stay sharp longer. best. If you haven’t heard of Hinoki or Aomori Hiba woods before, there are three kinds of wood well known as Three Japanese Precious Woods” called Aomori Hiba, Kiso Hinoki and Akita Sugi that we use in our materials. They have been used to build shrines, temples and traditional reception rooms because they are known for their superior quality and sturdiness. You can cut foods more comfortable with less slippery on these boards. In addition to that, this wood is better for your cutting edge, which means the sharpness of your kitchen knives lasts longer and hygienic. Hinoki, along with Aomori Hiba are one of the best materials for cutting boards and has a long-lasting rich, refreshing wooden smell which will fill your home with a sense of being surrounded by nature. t we can confirm that upgrading to a cutting board like this will bring you joy in the kitchen every time you use it. You have to take better care of this cutting board than our plastic recommendation; by cleaning it immediately after use and avoiding the dishwasher. But these cutting boards are unique and will last you a long time, so if you’re ready for an upgrade from the usual plastic cutting boards most home cooks sport nowadays, this one gets our vote and hearts. For cutting up a whole chicken and other meats, to vegetables, to stripping herbs, to even cutting the stems off of flowers, these kitchen and herb shears from Daiwood x Japana (Japanese factory based in Sanjo) are fantastic. They’re extremely sharp, heavy duty, and comfortable. The blades easily separate for easy cleaning. With 200 reviews and a 5-star rating, these shears are a fantastic value and deserve a spot in your kitchen. A paring knife (also called petty) is a kitchen knife with a short blade that can be used for a multitude of tasks. You can peel and chop with it, and the small tip is great for fine work like coring strawberries (or similar). Moritaka petty 150mm aogami super is one of the best utility knives. Japanese made knives are of the highest quality and recommended by the best European chefs. Loved by foodies around the world. If you’re going to purchase a quality chef’s knife (it doesn’t need to be Japanese one, although we highly recommend that..) you’ll want to take care of it so it lasts a lifetime. It doesn’t take many tools or much time to maintain a quality knife, and this 12-inch ceramic honing rod from Messermeister is one of those tools (yes, we’re recommending German product :). Contrary to popular belief, most honing rods don’t actually sharpen your blade. Rather, they realign your knife’s edges quickly and efficiently. 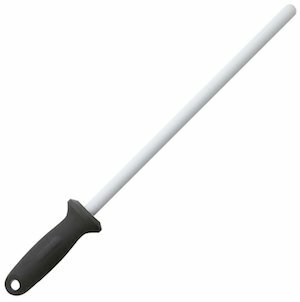 Because this honing rod is made of hard ceramic, however, it is capable of both sharpening and honing your knives. It works especially well with our recommended chef’s knife pick (Moritaka 210mm Gyuto Kurouchi Aogami Super). Japanese whetstones (also called water stones) – both natural and synthetic – are known for their quick-working qualities, not only for Japanese blades, but also for their Western equivalents. The small particles that do the cutting are loosely bound together in the stone, and so during sharpening with the whetstone, the surface particles are quickly washed out, allowing new, sharp, particles to start working on the blade. These whetstones must be lubricated only with water! Never use oil or other lubricants! The eternal problem – how to best store your sharp knives. If you love your knives, you probably already know the basics: You have to have them sharpened regularly and cleaned after use. You also need to keep them out of the dishwasher. Or don’t leave them in the sink. Or remembering of drying them before storing them. When it comes to storing your knives, there are few solutions which you may consider. Finding the right home for your knives is more than just a question of kitchen organisation. The right knife storage can help your knives stay sharper longer—and help your kitchen look fancier, too. We’ve tried many magnetic racks but we were quite happy with their performance – some had only pointed magnets so knives were stuck to one side and sliding down from areas where magnets did not work. Some had very weak magnets or got weakened after couple of months of using. That’s why we decided to research, invest in the best materials and reach out to the top wood specialists and carpenters to make the ultimate, modern and minimalistic looking rack (see above). We used the best quality materials (there is a version with copper and brass – check! ), hence the price isn’t at its lowest but once you hang this rack in your home – you will understand why. Ps. Magnets are magnets, so you don’t need to store knives only (remember, ceramic knives won’t hold) – it can be other tools such as shears, keys – whatever you need to keep in hand. Need more advice? Read here: Knife drawer vs. knife block vs. magnetic strip – what is better? And last but not least – A trivet. A trivet is a heat resistant pad that you place hot dishes on, so you don’t burn your table. Quite unusual essential you may think. But if you think of how many times you handled pipping hot dishes and anything flat, non-metal and available within the reach had to do. We love love the trivets we stock, because they’re both functional, high quality and fashionable and do what they’re supposed to do. Instead of ugly cloth trivets that get stained easily, pick up these beautiful walnut or oak trivets that will last a long time and are easy to clean. Stocking for a minimalist and well-organised kitchen with quality cookware doesn’t have to be frustrating or cost a lot of money. By purchasing only high-quality multi-purpose items that have a strong value proposition you can end up with a fully stocked kitchen that will last a lifetime (without costing you an arm and a leg! ).